When I first heard about the 2.3L DOHC I was intrigued. You don't often hear about four cylinder cars much over 2 litres - above that upper level manufacturers tend to go for straight or V sixes. What Ford clearly intended is a bigger 4-cylinder engine for the flagship of their range - the Scorpio - and also something meaty for the Galaxy. In this case, they have increased the bore of a 2.0L DOHC engine to 89.6mm and thus increased the capacity to 2295cc. Of course, a four cylinder makes sense: less complexity, lighter weight, simpler ignition, and so the list goes on. When Ford scaled down a 2.9L Cologne V6 to make an engine of 2.4L for the Granada it was not a great success, generally reckoned to be underpowered for its fuel consumption. But if that is the case, why not a four litre four cylinder in-line engine? Why bother with the huge expense of developing V6s and managing the greater length of the straight 6? After all, all you have to do is bore out the cylinders and increase the crank throw, eh? You have the computer graphics for a 2 litre four cylinder - all you should have to do is scale the engine up? There are two pistons at the top of their cylinders and two at the bottom so it all balances out, doesn't it? Er - not quite. Stay with me and let's find out how an invention made in 1911 has made it possible. In order to have a smooth and refined engine you must first make sure that it doesn't rip itself off its mountings and cartwheel down the road, so there are four forces that must be addressed. They are Component Balance, Firing Order, Primary Balance, and Secondary Balance. The first two are only common sense. If you have machinery spinning and reciprocating you must check that each part weighs roughly the same, and that spinning items are locked so that imbalances do not combine together to create vibration. For this reason the flywheel is commonly keyed or dowelled so that it can only be installed in one position, and so on. 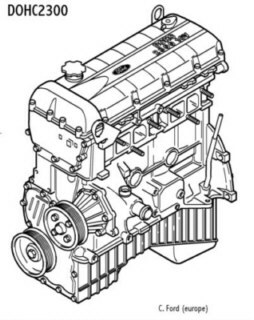 The diagram shows that the four cylinder in-line engine has good Primary balance. But what of the Secondary Balance - and what is it?